Advance our quality of life and protect the beauty and natural resources of Sonoma County for all generations through grassroots political action and education. We exist to mobilize and give voice to all of our environmentally concerned residents, encouraging action that will be seen and felt in our communities for years to come. You can help keep our organization one of the most politically effective groups in the area by donating or volunteering today. Please view our successes, volunteer opportunities, and Political Action Committee pages to learn more about how you can become an environmental steward for Sonoma County! SCCA Endorsed Candidates Won 75% of Local Positions in November! Measure M, Sonoma County Parks for All, won with over 72% of the vote! This was achieved through support of the SCCA canvass knocking on over 10,000 doors around the county. 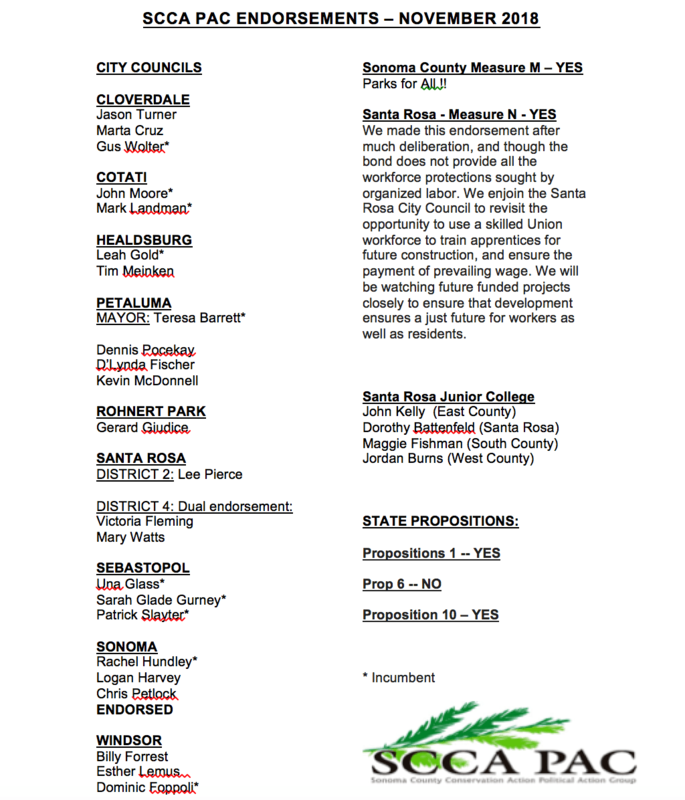 Also, SCCA-endorsed candidates for City Councils and SRJC Board of Trustees had a 75% success rate in the November election! 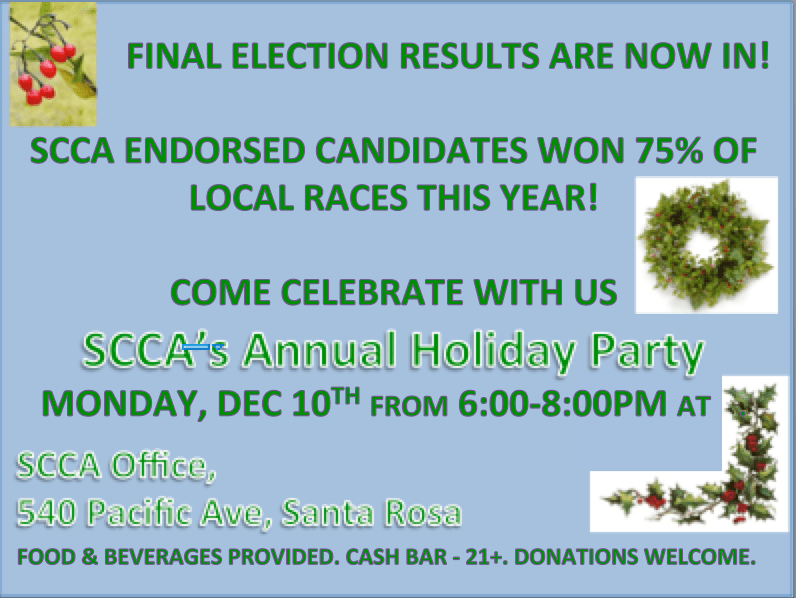 SCCA HOLIDAY PARTY COMING UP ON DECEMBER 10th! We hope you can join us! After many weeks of reading candidate questionnaires, conducting interviews and doing research, we have released our endorsements for this November 6th election. We hope you will take our endorsements seriously and VOTE FOR THE ENVIRONMENT! Download our 2018 Endorsements to take with you to the poll! The devastation that hit Sonoma County residents, students, small business owners, workers and our environment during the 2017 wild fires was enormous. With well over 7,000 structures destroyed, our community had to come together like never before. 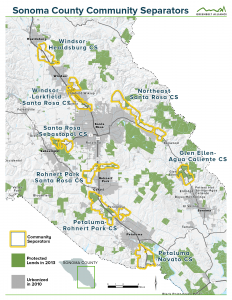 As a leader in grassroots mobilization, Sonoma County Conservation Action stepped in on Day 1 to help our community stay informed, work together and develop a platform for long term relief coordination. To do this, we helped launch the SonomaCounty.Recovers.org website, a locally-managed bilingual website that works with local organizations, government and volunteers to help fire victims meet their individual needs without delay. This was the first step towards helping our community members rebuild their quality of life in the wake of this disaster. Read more. 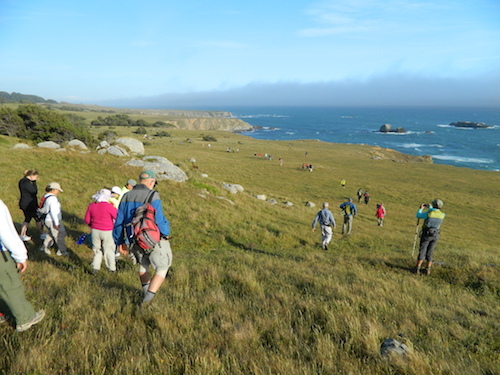 Stop the Trump takeaway of Sonoma and Mendocino coastal protections. Trump’s “America-First Offshore Energy Strategy” is moving forward and will open up our National Marine Sanctuaries to drilling and mining – the North Bay’s very own Cordell bank and Greater Farallones National Marine Sanctuaries are on that target list. July 26th is the deadline to defend our sanctuaries — we urge you to speak up now before these are lost forever.